Happy birthday, Billy Lee Riley! Born in Pocahontas, Arkansas exactly 84 years ago (Oct. 5, 1933), Riley was the son of a sharecropper who learned to play guitar from Afican-American farm hands. 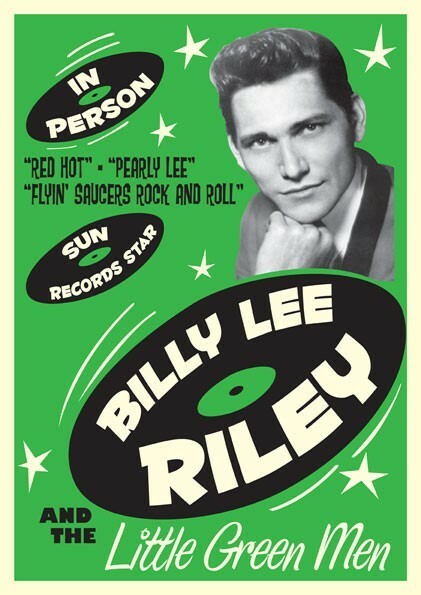 Riley, who died in 2009, never got as big as Elvis or Carl Perkins or Jerry Lee Lewis (who played piano on his biggest hit), or other Sun Records stars. But Billy Lee Riley made rockabilly go intergalactic. It was a crazy novelty song he recorded for Sun Records in 1957 called "Flying Saucer Rock 'n' Roll" -- a tune that forever cemented the cosmic links between UFOs, 1950s rock 'n' roll, tacky sci-fi movies and Cold War paranoia. You must realize that Commies and aliens were out to destroy America -- and some truly believed that a bunch of wild-eyed hillbillies playing savage, unholy music were leading the way. But it in the years before "Flying Saucers," in the early 1950s, Riley gigged around Arkansas in various bands, including one called The Dixie Ramblers, which included Cowboy Jack Clement. Clement and fellow Rambler Slim Wallace recorded a couple of sides by Riley in 1956, which impressed Sam Phillips, who released a single for Sun Records. Another classic Riley song for Sun was "Pearly Lee." "So Billy became what is known in the industry -- a condescending term, by the way -- as a one-hit wonder. But sometimes, just sometimes, once in a while, a one-hit wonder can make a more powerful impact than a recording star who's got 20 or 30 hits behind him. And Billy's hit song was called "Red Hot," and it was red hot. It could blast you out of your skull and make you feel happy about it. Change your life. "